With exactly two weeks left until Star Wars Battlefront arrives on PlayStation 4, Xbox One and PC formats, Electronic Arts has released yet another trailer for this highly-anticipated video game, which showcases new footage from the Battle of Jakku downloadable content (DLC). Unfortunately, fans won't get to access this DLC right away, arriving December 8, but those who pre-order the game will get exclusive access one week early, on December 1. The Battle of Jakku will also help get fans ready for the highly-anticipated Star Wars: The Force Awakens, arriving in theaters December 18. 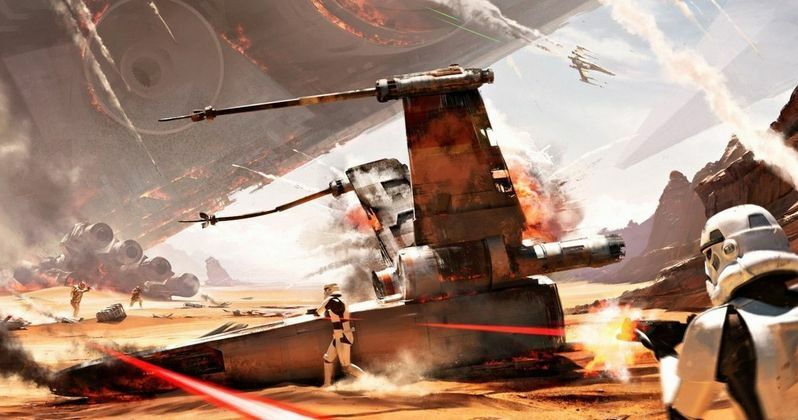 The second trailer for Star Wars: The Force Awakens released in April showcased a massive Imperial Star Destroyer crashed in the Jakku desert, and this video game level will show how that happened, serving as a direct prequel to the movie. The Battle of Jakku will be one of several locations featured in Star Wars Battlefront, showing that the conflict which once engulfed the galaxy remains alive and well. From the smoldering wreckage of the fallen giant to the X-wing being used as cover during a firefight between Rebel and Imperial troops, things haven't really calmed down after Return of the Jedi. Star Wars gamers won't be disappointed. Star Wars Battlefront will be released on PlayStation 4, Xbox One and PC formats starting November 17, just in time for the Christmas shopping season. Just one month later, Star Wars: The Force Awakens will hit theaters nationwide, which is expected to break box office records in just a few short months. Given the massive fan base for Star Wars, it's possible that Star Wars Battlefront could set some video game sales records of its own, but we'll have to wait and see. Experience a tiny part of the Battle of Jakku with the latest trailer, and stay tuned for more on Star Wars Battlefront.